Following their two-year review cycle, the R&A and the USGA have announced 28 new Decisions, have revised 51 Decisions and withdrawn 1 Decision for the 2010-2011 edition of Decisions on the Rules of Golf. The changes will take effect on 1st January, 2010. Remember, that there will be no changes to the Rules of Golf until the four-year review, which is not due until 1st January 2012. I have to confess that so far I have only scanned quickly through the new and revised Decisions and I have not seen anything that stands out as changing the game that we play in any material way. Q. When a player is replacing his ball, is it permissible for him to position the ball so that the trademark is aimed along the line of putt to indicate the line of play? Q. May a player draw a line on his ball and, when replacing his ball, position the ball so that the line or the trademark on the ball is aimed to indicate the line of play? There is an increasing tendency for players to draw a line around their golf balls to assist them in lining up their ball to indicate the line of play. 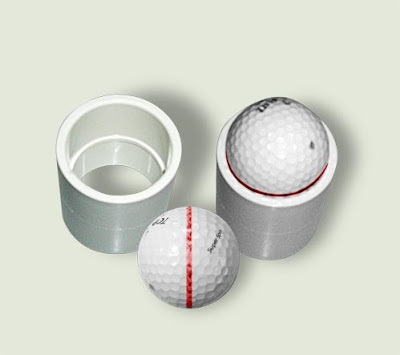 Callaway, the golf products giant, offers their Line-M-Up Pro Guide and this picture shows a home-made ball marker using a standard PVC 1-1/4 coupling available from most hardware stores. Rule 12-2 ..... Each player should put an identification mark on his ball (but this does not mention a line). Ruling: that mark may include a line drawn anywhere on the ball. Rule 8-2a ..... any mark placed by the player or with his knowledge to indicate the line must be removed before the stroke is made. Ruling: this does not refer to a mark on the ball itself. Rule 8-2b ..... a mark must not be placed anywhere to indicate a line for putting. Ruling: this does not refer to a mark on the ball itself. Definition of Tee ..... a tee must not be designed or manufactured in such a way that it could indicate the line of play or influence the movement of the ball. Ruling: but the ball may have a mark indicating the line of play on the teeing ground or on the putting green. I am pleased that the Ruling Bodies have clarified this situation relating to how balls may be marked. The relevant Rule has not changed at all, but now players have a clear Decision that they can refer to if someone challenges their entitlement to draw a line around the circumference of their ball to use for lining-up purposes when placing it on the teeing ground, or replacing it under the Rules. If you already have a copy of my book ‘999 Questions on the Rules of Golf’ then I now recommend that you acquire a copy of ‘Decisions on the Rules of Golf 2010-2011’, available from either the R&A or USGA. Looking for a unique present for a golfer? Click here for the perfect answer. What are your personal thoughts on golfers having their caddy line them up and then backing off when the ball is addressed? I have no problems with this as it is within the Rules. My wife asks me to line up her putts in this way all the time but personally I know that it would put me off, and I am surprised that some Pros feel the need to do it. If the line has faded, can you redraw it on the putting green before putting, or would you have to wait until finishing out that hole before doing so? There is no restriction in the Rules as to when personal markings may be drawn on a ball. Is my Ball on the Putting Green or the Fringe?